The Prince County Court House dominates the intersection of Central and Notre Dame Streets in Summerside, PEI. This Italianate building with some modernization is built of brick with freestone accents and continues to serve its original purpose. The designation includes the building and its surrounding property. The construction of the new court house in Summerside in 1873-76 was the tangible evidence of the town’s replacing nearby St. Eleanors as the seat of justice and the capital of Prince County. The move recognised and symbolised Summerside’s increasing prosperity and importance as a regional service centre and established its dominance over the surrounding communities. The land was purchased from the estate of Joseph Green, the son of a Loyalist settler who had been granted much of the land where Summerside now stands. The new court house was first presided over by Judge William Henry Pope, a Father of Confederation. 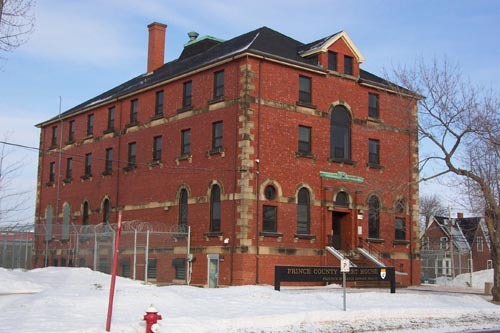 The Prince County Court House, or Summerside Law Courts, is also significant for the role it played in the Fire of 1906, which levelled 155 buildings in the town. This substantial brick structure shielded the wooden buildings behind it and effectively checked the fire, although it itself was completely gutted. The court house was rebuilt and became a testimony to the resiliency of the community. The building is also significant because it displays the craftsmanship of many local and provincial tradespeople. Designed by Island architect John Corbett, it was constructed by Thomas Beattie, who also built the Indian Head lighthouse, another significant Summerside structure. D.R. Morrison and Peter G. Clark, both prominent local contractors of the time, oversaw the 1907 reconstruction. The 1938 expansion, including the addition of a third storey, some changes to the external appearance of the building and the remodelling of the interior, was conducted by M.F. Schurman Co. Ltd., one of the oldest and largest contracting firms on the Island. One of the earliest images of the court house is a 1904 pencil and ink drawing by Summerside artist John Gothard Baker. The court house is a rare example of Italianate architecture in the western half of the Province. It is also one of the oldest public buildings in Summerside.